Finding the right vehicle to suit your needs can be difficult, but the new 2019 Honda Accord is here to try and make your decision easy. From its standard safety tech to its peppy performance, this midsize sedan is an appealing choice for many consumers. Here are a few reasons why you should fall in love with the 2019 Accord. Safety tech comes standard. Feel confident behind the wheel of the Accord with the standard Honda Sensing® suite of driver-assistance technologies. You will receive a Road Departure Mitigation System, Forward Collision Warning, a Collision Mitigation Braking System™, Lane Departure Warning, a Lane Keeping Assist System, Adaptive Cruise Control, and a Traffic Sign Recognition System on every 2019 Accord model. The right powertrain for you. There are three engine options to choose from on the 2019 Accord. The first is the standard 1.5-liter turbocharged four-cylinder, which puts out 192 horsepower and 192 lb-ft of torque. On the Sport and EX-L trims, you will also find an optional 2.0-liter turbocharged four-cylinder. This engine puts out 252 horsepower and 273 lb-ft of torque. Finally, for those consumers who are eco-minded, the Accord Hybrid has 48 mpg in the city and 48 mpg on the highway, while putting out 212 horsepower and 232 lb-ft of torque. 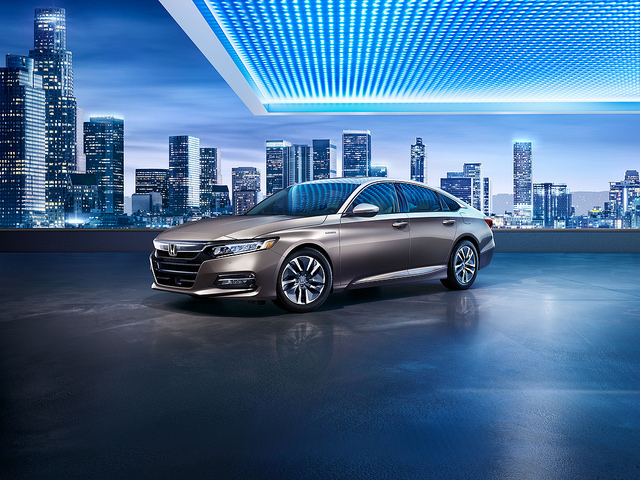 The new 2019 Honda Accord is one of the smartest and most stylish vehicles in its segment. Test drive it today at Hardin County Honda.